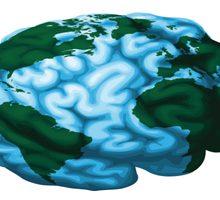 This webinar by Mark Trexler of the Climatographers is part of the BigThinker Series hosted by TheBrain™, joining other Big Thinker webinars featuring the “Brains” of management guru David Allen, historian James Burke, and others. It was recorded in its entirety and is available here: Climate Watson. Mind Mapping Climate Change and Risk Management in Your Brain. The webinar explores both the topics of knowledge management and climate change. It is designed to hold the interest of viewers regardless of which audience they are coming from. The 90-minute recorded webinar contains both Dr. Trexler’s structured presentation (the first 45 minutes) as well as the extended question and answer period. We have structured the discussion to be interesting regardless of whether you are most interested in knowledge management or in climate change. If you’re interested in both, it should be fascinating. The webinar introduces our Climate Watson knowledge management system for climate risk. It explores our fundamental hypothesis that getting the right risk and opportunity-relevant information to the right decision-maker at the right time can make a real difference when it comes to helping answer the two critical questions that underlie all decision making: “is it worth it to me” and “can I do it?” If you have ever used mind mapping techniques, you can think of TheBrain™ as sort of a 3D mind map, which vastly expands its ability to help find the “right information at the right time” from a potentially infinite amount of information. We’ll be conducting our own webinars from time to time on specific climate change and climate risk topics. Subscribe on The Climatographers website to be sure to find out the when and what of those events!